This post was inspired by questions from early readers of THE PERFECT SCORE (scheduled for release on October 3rd). THE PERFECT SCORE is a sixth-grade school story featuring a new cast of characters (a mix of boys and girls) who take turns telling you about their year. The kids find themselves in the same after-school program for different reasons. They’re not necessarily excited about the program—or each other. But through their work in the program, and events in and out of school, they find themselves in a tricky situation where they wrestle questions of right and wrong. They’re not sure what to do, but decisions will be made and things will change for them and for the people around them. The question is: Will it be for the better? Sometimes we do the wrong things for the right reasons. I’ve been asked many times how I keep track of my characters. Do I write the entire story for one character and then go back and do a second voice, and so on? Or do I juggle all of them as I go along? Before I answer that, let me be clear. While some have said I have a talent for writing in multiple voices (thank you for the compliment), I don’t see it like that. Maybe I have a knack for it. I certainly love it. But it is not easy for me. It’s not talent that gets the job done. It takes mental endurance, patience and persistence, and tons of revising. It takes good old-fashioned hard work—and lots of it. Now, to answer the specific question about how I write with multiple perspectives. Keeping track of a cast of characters and their many back stories does take organization. I use a grid (see picture #1 for an example from MR. TERUPT FALLS AGAIN). 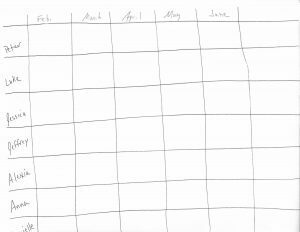 I do not have the grid completely filled in before I start. There are empty squares, but I have enough that I’m excited and can’t wait to get going. So I begin, writing with all of my characters as I go along, weaving their stories together. 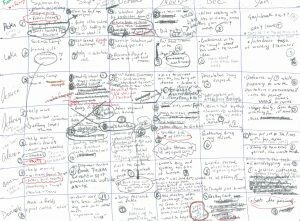 As I write, I learn more about the story and the characters, and eventually the grid is completed (see picture #2). All that being said, I must admit, when I first wrote THE PERFECT SCORE I only had four characters telling the story. My first revision involved adding a fifth voice (Trevor’s). I already had Trevor in the story, but now I had to insert and weave his chapters throughout. I started that process by making a new grid and then going from start to finish with all five kids. I’m so happy I did this work because I can’t wait for my readers to meet Trevor and the rest of the kids in THE PERFECT SCORE (pre-order here)!